This was a little dish that I came across as a part of the Most Amazing Organic Breakfast at the Klaus K hotel when I was in Helsinki last summer for a wedding. It was hidden in amongst the breakfast goodies, and at first, it did not look all that dramatic. In terms of appearance, it was clearly overshadowed by bright orange buckthorn and vivid purple blueberry juices, cakes, cheeses, rolls and similar, but I’m a mushroom lover, and decided to take a little of it, just to try. I must admit, this was with a slight twinge of reluctance, for their version was rather finely hacked, and a couple of us were looking at it for a while to work out whether it really was mushroom salad, or some disguised tuna mayo to catch out unwary visitors. Luckily, it was tuna-free, and it was delicious. So delicious. Utterly delicious! I kept going back for more, and by day three, I was piling the breakfast plate high with the stuff. 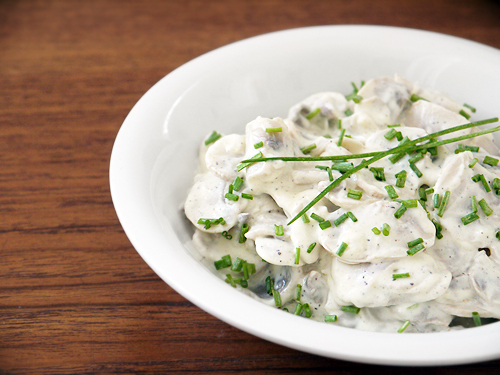 Given how good it tastes, this really is a rather simple recipe – sliced mushrooms, mixed with a savoury cream sauce. The only “trick” is that the mushrooms are boiled for a minute or two after slicing, so they take on a texture which is not quite raw, but they’re not as tough as they can been when they’ve been cooked for ages. They keep a little bite, but they are not too fragile. 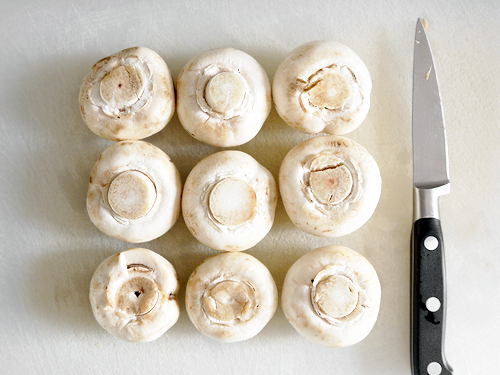 However, if you prefer your mushrooms fresh, I don’t see any reason why you couldn’t skip the cooking step and go raw. I was pretty confident that I could work out a recipe for this salad myself – surely I just had to work out how to combine mushrooms, cream, salt, pepper and some chives. Well, I was more or less right on that. However, I checked a few sources, and was being recommended some horrific levels of salt. Two teaspoons to three tablespoons of cream! My brain was yelling to me that this was clearly far, far, far too much, so I decided to follow the method (cook the mushrooms in water with a squeeze of lemon juice, then make the sauce), but let myself be guided by by own sense of taste – just a little salt in the sauce, and then round it out with a dash of sugar and some freshly ground black pepper. This is also a good rule of thumb when you see a recipe, either in a book or online – read it, and think about it – does it work? Does it have everything you’re expecting? If someone promises the lightest, fluffiest cake but there is nothing in the method or the ingredients list to provide the necessary va-va-voom for lift off, are you really going to follow it blindly? Exactly! With the mushrooms done and the sauce mixed to my taste, I combined the lot, and the flavour was almost perfectly as I remembered it. Substantial, earthy and intensely savoury. It reminded me a little of walking in the forest on a damp day – which is, in itself, a rather Nordic thing to do. But something wasn’t quite there. Then I remembered that I had not added any onion – it just needed a tablespoon of very finely shredded onion. I added it, and that did the trick – it just added that tiny extra tangy touch to finish off the dish. So there you have it – a light, simply Finnish mushroom salad that you can enjoy when spring and summer finally get here, and a nice savoury contrast to the sweet Nordic goodies I’ve looked at recently (creamy semlor buns and cinnamon rolls). There has been a lot written of late about how this year we’re going to see Scandinavian and Nordic food become more popular, and frankly, it’s about time too! There are some real culinary gems in there waiting to be discovered. Think of dinner outside on a warm evening when the sun hardly sets…and given I am writing this as I see pouring rain and trails of water flowing down the glass, that cannot come soon enough for me! Wash the mushrooms and slice finely. 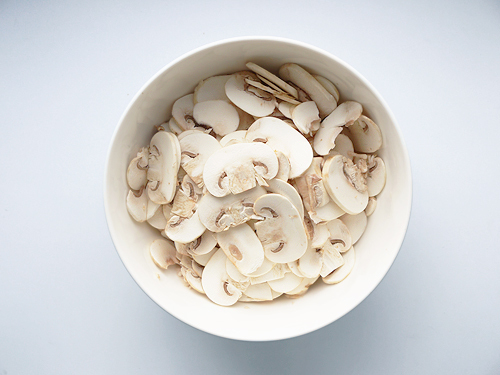 Bring a pan of water to the boil, add a squeeze of lemon juice, then boil the mushrooms for 2 minutes. Drain and pat the mushrooms dry with some paper towel. While the mushrooms are cooling, make the sauce – combine the cream, salt, sugar, pepper and onion. If too thick, add a dash of water. Taste and adjust the seasoning as required, the mix with the mushrooms. Just before serving, put into a bowl and sprinkle with chopped fresh chives. Worth making? The only thing that is annoying with this reicpe is just how long I waited before making it. The flavour is absolutely delicious, the method is very easy, and it makes for a wonderful addition to dinner as a side dish, or as part of a breakfast spread. Highly recommended.